An array of mouth-watering salsas! Mexican food gift pack. One more time ... what makes a Mexican meal dance on the table? Why-salsa-of course! It's the most popular condiment world-wide! How many types of salsa are there? Lots! Here is a sampler of some of our favorites that make the perfect gift for that special salsa-lover (or aspiring Mexican chef) in your life! Remember, salsa is a staple in every Mexican food aficionado's kitchen. Try these with chips, tacos, spooned over burritos, chiles rellenos, eggs, your favorite meats, fish and even chicken. Go for the gusto! Have fun ... and spice up your life in the process! About Salsa:Salsas or Salsa is the most basic dish in any Mexican food meal, often served as an appetizer with chips and used to jazz up everything from eggs to main courses. Salsas can be made from fresh, raw vegetables or cooked. Every Mexican food chef has their own particular way of making salsa. No two are ever alike! Basic ingredients are chiles, tomatoes, onions, cilantro and spices. Please visit our Salsa Mexican recipes section at Mexican Salsas. �Una variedad de salsas que hacen agua la boca! Una vez m�s...�qu� hace una comida mexicana bailar en la mesa? �La salsa, desde luego! Es el condimento m�s popular en el mundo entero. �Cu�ntos tipos de salsa hay? �Muchos! �Este es un muestrario de algunas de nuestras salsas favoritas que hacen que sea el regalo favorito para esa persona amante de la salsa (o que aspira a ser chef) en su vida. 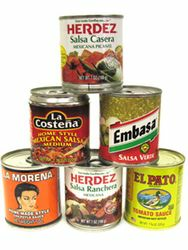 Recuerde, la salsa es un producto b�sico en la cocina de cada aficionado a la comida mexicana. Pru�belas con totopos, tacos, p�ngala sobre los burritos, chiles rellenos, huevos, sus carnes favoritas, pescados y hasta pollo. �H�galo por el gusto de hacerlo! Divi�rtase...y, en el proceso, �p�ngale sabor a su vida!